Dowling Park, FL--The Friday following Thanksgiving has become the time for the Fellow Travelers to have their biggest paddle of the year. November 25, 2005, again saw a congenial group meet at Dowling Park and begin the paddle to the new state pa rk at Lafayette Blue Springs (formerly called Yana Blue Springs Park) with a Saturday paddle to Telford Spring. Nineteen paddlers between the ages of twelve and seventy met for the launching. Since the distance for the first day was only to be about nine miles, there was no early morning rush. By about ten all the vehicles had been shuttled and the boaters boarded their craft for a truly exceptional day. The November weather in North Florida can range from frigid to very warm, but the Fellow Travelers have generally had pleasant experiences. But this year was the best ever. The sky was blue, and the daytime temperatures reached into the seventies. The night saw the fifties, but no one even needed a tent heater this time. The tr avelers always give our weatherman, Art Shelfer, his due for arranging such nice weather. John Williams brought his daughter, Leigh Anne, and she brought a rookie from Alaska, Paul Foglia. Paul may be the long distance winner of all times--it depends if Denali National Park is farther away than Panama. Loretta Enz brought her new orange kayak for its rookie voyage and also brought Kim Joiner for her first Fellow Traveler outing. Jerry and Donna Ellis paddled on Friday only. Hamp Chauncey came over from Jacksonville. The Moyes (Roy, Dave, Eric, Justin, and Nathan) came up from the Altamonte Springs area. Joey journeyed from Meigs. Terrie came from Baker County. Art and Janice Shelfer came from Tallahassee and arrived early. Charlie and Diane Stines came down to chaperone the crew. The water was relatively low. The low water assures that the springs will be clear and somewhat restricts power boat traffic. Once on the water, everyone found the paddling to be pleasant. The section of the Suwannee from Dowling Park to Lafayette Blue Springs is not the most scenic part of the river because the river is quite wide and straight by that point, and the limestone banks and sandbars typical of the upper stretches are much less common. But the upper reaches of the river does not have the crystal clear springs which are found farther downstream. The first stop was at Charles Spring. The paddlers arrived around noon, and there was time for a leisurely lunch break. Some local kids were enjoying swimming underneath the natural li mestone bridges which separate the spring into three distinct pools. At higher water levels the separate pools are not evident. Because of the low water levels, it was not possible to actually canoe into the spring, so the boats were docked along the banks at the mouth of the spring run. Charlie had incorrectly marked the location of the park on the GPS, and it showed the park to be incredibly close to Charles Spring. Several of the canoeists went to scout things out and found a beautiful campsite almost directly across the river from the spring. After that, the boaters again settled into their respective crafts and headed downstream. The idea was to paddle up Anderson Mill Pond run to the spring. The low water prevented any travel up the spring run to Anderson Mill Pond, however. The group had to be content with viewing the pretty green water and watc hing scores of turtles sunning on logs. Everyone arrived at Lafayette Blue Springs State Park before three. The spring was exceptionally clear and was running strong. Some of the paddlers actually paddled up into the spring, but others found the current too swift. 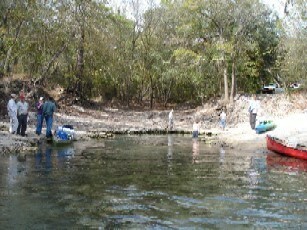 The boats were beached at the spring, the gear unloaded, and everyone went to the campsites. After running the shuttle, all the tents were pitched. There was still time to spare before supper, and it was spent in typical Fellow Traveler fashion of spirited conversations and acting lazy. Supper was potluck, and luck was the key word. The Moyes brought a ham, Diane brought a pot roast with vegetables, Joey brought green beans with new potatoes, the Ellises brought a Caesar salad and fruit, John cooked his world-famous curly fries, the Shelfers brought a delicious gumbo dish and, and Loretta brought potato salad. Art cooked sourdough bread in his Dutch oven. For dessert, John did his usual superb job of making a pineapple upside-down cake in the D utch oven, and Diane provided a sweet treat called monkey bread. Once the supper was finished, Donna and Jerry left to feed their horses and never returned. Everyone else to the Williams campsite and sat around the campfire telling lies. (Hamp had the foresight to bring firewood.) Eventually everyone went to sleep. Kim got up to find her car behind crime scene tape, and some detective work showed that the guilty culprit was not the law enforcement officer. However, her real initiation is yet to come. There were several new major awards, but the best one was that the cart left to John by a deceased homeless woman from Plains. Leigh Anne reminded us that the story of its acquistion was told on a canoe trip. The weather was so perfect for sleeping that Charlie did not get up before daylight to prepare coffee. Actually, Hamp, John, Loretta, and Kim were all out of bed before the King arose. Breakfast was a relaxed affair. Art and Roy cooked two varieties of sausage, Justin and Nathan prepared toast, Charlie and Roy made grits, Joey and Charlie scrambled eggs (they were yellow, not gray! ), and Roy prepared some more ham. The leftover monkey bread and pineapple upside-down cake were finished off by the hungry crew. It was after ten when the morning trip began. The temperature was warm, and the river was still very pretty. It seemed only a short voyage to the stop at Perry Spring. The spring is not among the best, but it is a good place for a break. Someone has built a huge home almost adjacent to the spring. It is a nice house, but it makes one yearn for the more primitive setting of just a few years ago. The gang spent quite a while at Perry Spring just enjoying one another’s company. After that, it was just a short paddle to the SR 51 bridge at Luraville. The shoals above the brid ge were not enough to present a danger, and there was enough water that the boats did not hang on the rocks. The shoals just added a little speeed to what was otherwise a totally tranquil river. Take-out was at Telford Spring. This is a beautiful spring, and it, too, has two pools separated by a natural bridge. Divers enjoy the cave system at Telford. The spring was clear, and it was remarkable free of litter for a nice change. After running the shuttle to get the vehicles at the state park, everyone said their good-byes and promised to return for more adventures. It was a nearly perfect trip.